SOMA Activation Details: How do I activate my game? From the creators of Amnesia: The Dark Descent comes SOMA, a sci-fi horror game set below the waves of the Atlantic ocean. Struggle to survive a hostile world that will make you question your very existence. SOMA is a sci-fi horror game from Frictional Games, the creators of Amnesia: The Dark Descent. It is an unsettling story about identity, consciousness, and what it means to be human.The radio is dead, food is running out, and the machines have started to think they are people. Underwater facility PATHOS-II has suffered an intolerable isolation and we’re going to have to make some tough decisions. What can be done? What makes sense? What is left to fight for?Enter the world of SOMA and face horrors buried deep beneath the ocean waves. Delve through locked terminals and secret documents to uncover the truth behind the chaos. Seek out the last remaining inhabitants and take part in the events that will ultimately shape the fate of the station. But be careful, danger lurks in every corner: corrupted humans, twisted creatures, insane robots, and even an inscrutable omnipresent A.I.You will need to figure out how to deal with each one of them. Just remember there’s no fighting back, either you outsmart your enemies or you get ready to run. Additional Notes: Integrated Intel graphics are not supported. They should work (Intel HD 4000-series or better), but with issues. Additional Notes: Proprietary drivers. Integrated Intel graphics are not supported. They should work (Intel HD 4000-series or better), but with issues. All digital goods are delivered via the GamePyro desktop application. 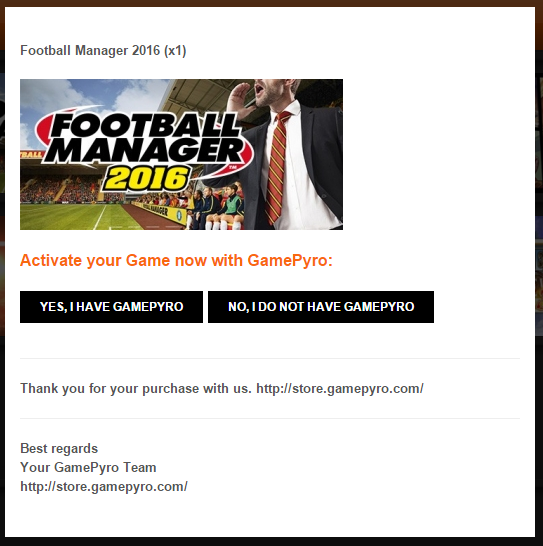 GamePyro and your games will be available for download at the end of the purchase. It is for easily get your Games like Steam, Origin, UPlay, GOG. You can click at your bought Game and then choose if you have GamePyro already installed or you an download and install it. 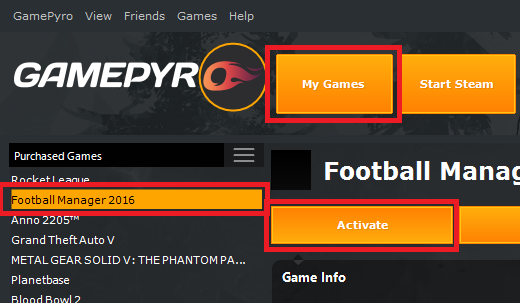 If you have GamePyro already installed you can click at yes i have gamepyro. Then GamePyro starts and you can activate your game. Or you open the GamePyro App and click at My Games Button and then select your bought Game and click activate. Where i can find my Game? Copyright © 2015 - 2017 GamePyro.com. All rights reserved. All trademarks are property of their respective owners in the US and other countries.